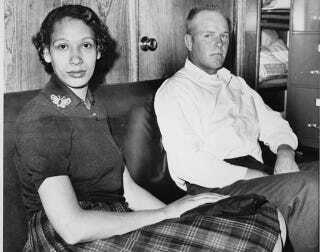 It's always seemed singularly appropriate that the couple behind the landmark Loving v. Virginia — in which the Supreme Court declared Virginia's anti-miscegenation statute unconstitutional — should have the name they did. And watching their story will give you chills. The timeliness of the story is obvious. And the documentary The Loving Story — currently seeking full funding through Kickstarter — uses amazing archival footage to bring it to stark, moving life. Putting faces and voices to the couple makes the story feel shockingly recent. The thing is, it is: Alabama only removed its anti-miscegenation statute from the books in 2000.